Ever bought a nice new Fuchsia from a garden center and then found, in the course of time, it becomes straggly and leggey? That beautiful full bushy plant covered in flowers is no longer the tight, dense plant that it used to be. The main cause is usually a lack of light, and you will notice that the stem is much longer between sets of leaves than it should be. Well it's not so hard to restore it to it's former glory as you might think. 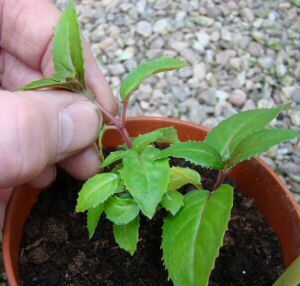 The best way, in my opinion, is to take cuttings from the plant and start from scratch. 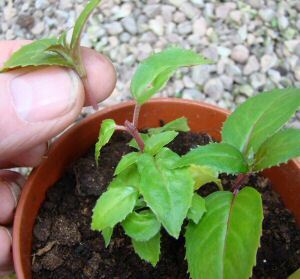 (see my guide to taking cuttings) Whether you do that or whether you work with the original plant is entirely up to you and will probably depend on whether or not you think the plant can be rescued. This page assumes we're working with a new plant but the technique is equally applicable to any plant that needs bushing up. 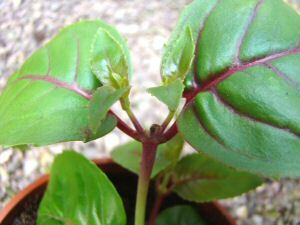 The technique simply involves removing the growing tips from the plants stems. It's hard to say exactly which tips should be removed but my own approach simply relies on what 'looks' good. Any stem that is growing longer than those around it (Fig.2) or any stem that is spoiling the nice appearance of the plant, are good candidates for removal. So, when you've found a stem that is suitable for removal just pinch it out using your thumb nail. 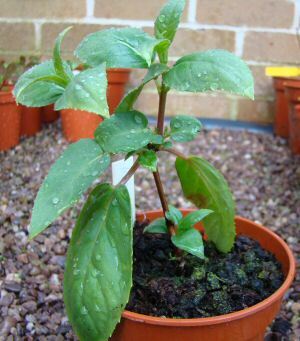 (Fig.3) If it's got a couple of pairs of leaves or more then it is an ideal candidate to be treated as a cutting from which a new plant can be grown. If it's not suitable for a cutting then just discard it. The really great thing about doing this is that from wherever you have pinched out a growing tip, TWO new stems will grow, (Fig. 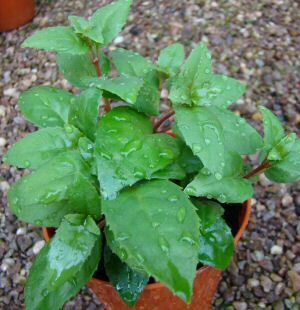 4) and this is why the plants soon become thicker, denser and bushier. Just look at the two plants in Figs 1 and 5 to see what a difference pinching out will make. The first has had no pinching out and the other has been pinched a couple of times. Now, in theory the more times you pinch out the growing tips, the bushier the plant becomes ... 1 stem becomes 2, and then 2 stems become 4, and so on. However, it's very important to bear in mind that the growing tip is also where the flowers will form. On average it takes something in the order of 6 to 8 weeks after pinching out, before flowers will form on the new stems. So, if you pinch out in mid-June you won't see any flowers until early or mid-August. Not a great plan if you want a wonderful display throughout the summer. I pinch out growing tips on my new plants quite liberally until the end of April but after that, only if it is really necessary ... and not at all from the end of May.